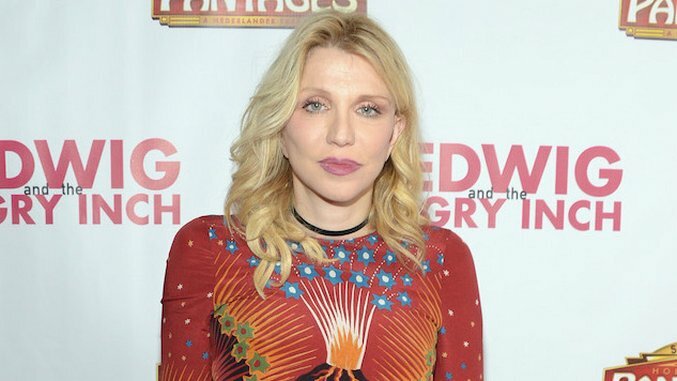 Courtney Love Fired Her Memoir Ghostwriter for Being "Too Tell-All"
Former Hole frontwoman Courtney Love wants to write a memoir—kind of. She won’t actually be writing it, and a lot of information will apparently be kept out. As Love revealed on Late Night With Seth Meyers last night, her memoir is in the works but already on its second ghostwriter. According to Love, the first ghostwriter was “too tell-all,” divulging too much information about her private life. “I have a lot of secrets I have to keep,” she said. Secrets she would have otherwise kept have since leaked on her Wikipedia page: “If it’s in my Wikipedia, it’s fair game,” she jokes. She also quipped that all her ghostwriter will have to base the memoir on is a printout of her Wikipedia page. On a more serious note, Love said she wants her story to be tasteful, citing memoirs by Patti Smith and Bob Dylan as inspirations for her own. Speaking of tasteful, Love will be starring as Kitty Menendez—who was famously murdered by her sons, Eric and Lyle Menendez, in 1989—in a forthcoming Lifetime movie about the case. You can watch Love’s chat with Seth Meyers on Late Night below.